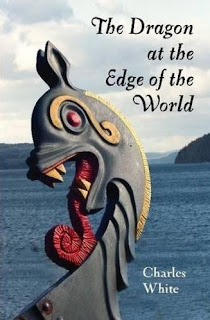 Dragon at the Edge of the World by Charles White is the story of two Viking brothers, Lief and Kevin, and now you know it's also a tongue-in-cheek fantasy. Apparently this includes home. When Lief's brother Kevin sails his new boat away from Greenland and winds up lost in North America, their mother nags Lief into rescuing Kevin. Mischief ensues when Kevin is captured by the Wendat Indians and Lief by the Mohawks. With each Indian tribe vying to use their confiscated Viking warships to destroy each other, the brothers have to find a way to survive. Through harrowing river trips, schemes, betrayals and rescues of damsels in distress, the brothers eventually come together to defeat the blood thirsty Rood Fugger before he can bring gunpowder to North America and destroy the Indian way of life - prematurely. The humor in "Dragon at the Edge of the World" is welcome, but there was room for more of it. Hopefully, Charles White, the author of "Dragon at the Edge of the World," will find more points of whimsy in his next book.